What a timely and important film this is. We meet the inspiring educators associated with Tucson’s embattled Mexican American Studies program, and a few of the many students whose lives have been transformed by it. And, straight from central casting, we meet the scoundrels trying to shut the program down—politicians who wrap their racism in a language of opportunity, individual rights, and Americanism. The stars of the film are the young people who establish a new relationship to life and learning through their classes and activism. As one of the students says in class: “I started thinking, “Oh, I’m a Chicana, I ain’t going to be able to graduate, I’m going to have kids young. . . . And then I started coming to these classes and I started seeing, like, why am I believing all this? Instead of believing it I should change it.” Precious Knowledge raises questions for all educators about how we can more authentically speak to students’ lives in the curriculum. And it confronts us with today’s Klan 2.0—bigots who quote Martin Luther King Jr. as they shutter Mexican American Studies classes and ban books. This is an essential film for professional development, teacher education, and high school classes addressing racial justice. Watch Ethnic Chauvinism or Modern Civil Rights Struggle? on PBS. For more info and to order the film, visit Dos Vatos Films. “Casting aside the inflammatory rhetoric and national headlines of the anti-ethnic-studies instigators, Precious Knowledge provides a clear-eyed portrait of students, teachers and their community struggling to deal with the nation’s most unnerving campus witch hunt in recent memory. 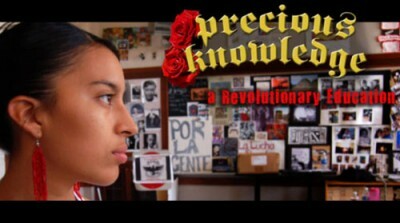 Tracing the political roots of the legislative ban—and the program’s own mandate and success to alleviate the long-time achievement gaps among Latino students—Precious Knowledge‘s riveting pacing and compelling portraits will astonish, infuriate and inspire viewers. In truth, Precious Knowledge is the type of unique and powerful film that could ultimately shift public perception and policy on one of the most misunderstood education programs in the country.”—Jeff Biggers, Huffington Post, read full review. Articles on the Zinn Education Project website about the campaign to save Mexican American Studies in Tucson.